Pest description and damage Several species of aphids may feed on the foliage stem, flower, bud, bark or root tissues of conifer and deciduous trees, shrubs as well as other plants in landscapes. Aphids tend to be small (0.0625 to 0.125 inch long), oval to pear-shaped, soft-bodied insects with piercing-sucking mouthparts. Color varies (black, green, pink, yellow, mottled, striped, etc. ), but most aphids tend to match host plant coloration. Aphids tend to feed in colonies and are often found on the new or most succulent plant tissues. Feeding damage to shrubs, trees and mature plants is usually minor, but can compromise the vigor of the host. When aphid populations are high, leaf and shoot distortion can occur. Aphids produce honeydew, a sweet, sticky secretion that collects on underlying plant tissues and encourages growth of a black sooty mold. In addition to cosmetics, honeydew may become a sticky nuisance when it falls on decks, cars, or other landscape surfaces. Some aphids are vectors of plant diseases, particularly viruses. Biology and life history Most aphid species have similar complicated life cycles. They tend to overwinter in the egg stage on perennial host plants and the eggs hatch early in the spring. 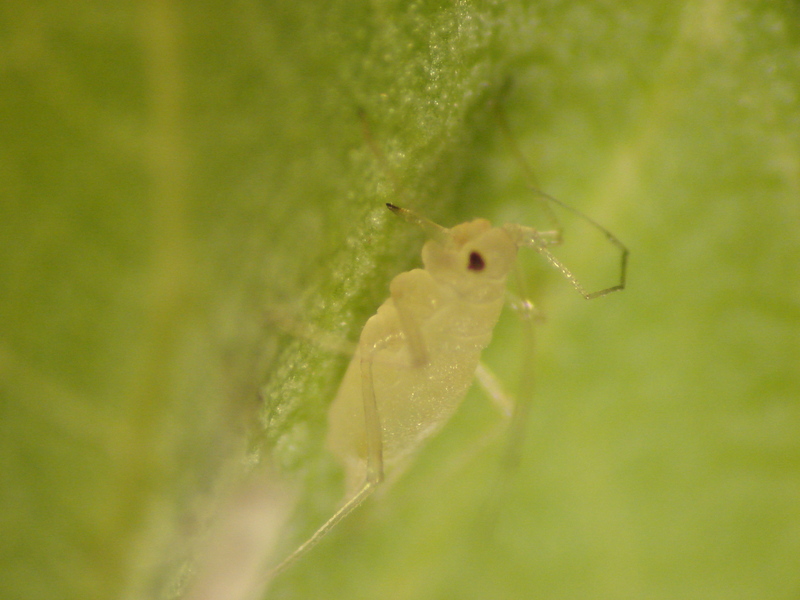 Newly-hatched aphids are found around and on the emerging leaf and flower tissues. Later in the spring, they are found as aphid colonies on the underside of leaves or near flower and fruit clusters. 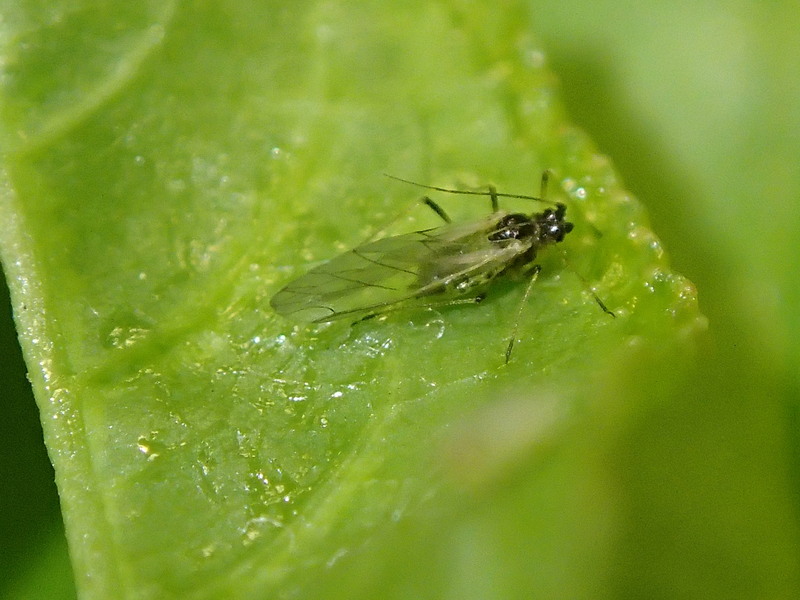 During the growing season, some aphids give birth to live offspring without mating, undergo multiple generations, and can build up high densities quickly. There may be as few as two generations or as many as 16 generations each year, depending on the species and climate. Some aphids are host plant specific, while others live on a wide variety of plants and weeds, and still others switch to different hosts. Aphids produce winged females and males. The winged aphids disperse to the winter hosts, mate and produce eggs that survive the winter on trees, shrubs or weeds. Pest monitoring Use yellow sticky traps, or other devices to detect aphids when they fly in from weedy or alternate hosts. Aphids tend to coincide with new growth flushes that may occur after a rain event or irrigation. Begin observing shoots for aphids prior to bud break or new growth flushes, as management is best done early while the aphids are less abundant. A dark plate or upside-down cup placed under the branches will show spatters of honeydew indicating the first activity and severity of the infestation. Also, check the upper surfaces of the lower leaves for honeydew. Check host plant for presence of natural enemies as well. Wash aphids from plants with a strong stream of water or by hand-wiping. 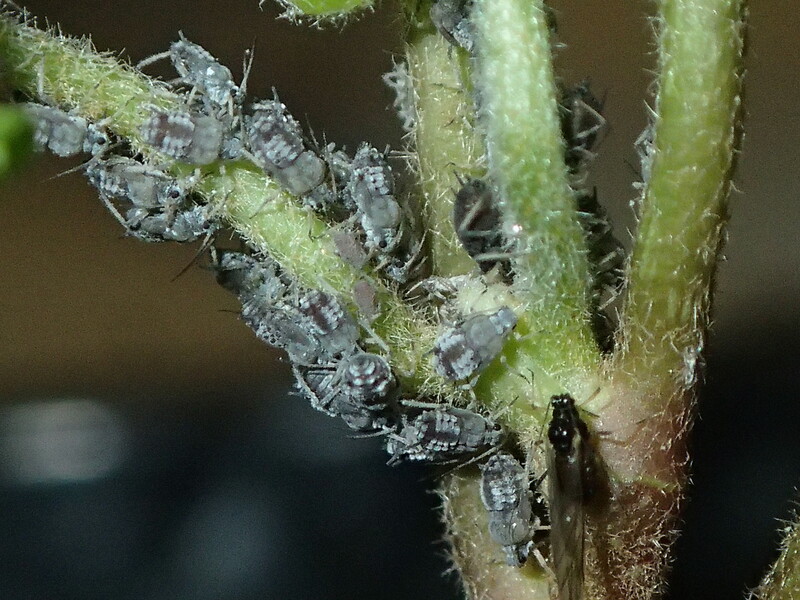 Aphid populations tend to be higher in plants that are fertilized liberally with nitrogen and heavily watered, as these practices produce flushes of succulent growth. Avoid excessive watering and use slow-release or organic sources of nitrogen. Aphids have many natural enemies, including lady beetles, syrphid fly larvae, green lacewings and parasitoid wasps. Check host plant closely for evidence of predators and avoid broad-spectrum insecticide applications that would disrupt these natural enemy populations. Braconid wasps are especially important parasitoids. Look for large swollen, hardened aphid "mummies" indicative of an aphid inhabited by a braconid larva. These pupate within the host and cut a semicircular "door" in the host's abdomen, through which the adult wasps exit the host. If the mummies are intact (without circular parasite exit holes), then cut the leaf pieces and move the mummies to areas where aphids are still a problem. The parasitoid wasp is a tiny black gnat-sized insect and may be seen searching leaves for aphids to parasitize. Control ants, which "farm" aphids to harvest honeydew and protect aphids from natural enemies.